I think it means that if the cell is stored at a 60% state of charge it will only be good to sit on a shelf for 5 years. Likely due to self discharge as you mention. Not sure if it has anything to do with degradation of the cell over time, but I have also read that LFP is best put to use, and not left sitting unused? Not to pretend I know anything about Balqon or Winston Battery, I know what I read or was told. Balqon said they have a container shipped once every 3 weeks from China. They fill it with customer orders or stock, it takes 21 days to deliver in LA port providing there is no snag. So you could say delivery is 6-8 weeks or more at best depending on how the order falls and if there is room in the container. Then they have to go to their shop and shipped to you ( 1-2 weeks ) . They went through a few rough years financially. Supposedly Winston Chang owner of Winston Battery owns portion of Balqon he bought as a bailout to keep a distributorship going here ( USA ). Take for what it's worth, internet BS maybe. I guess you'v noticed a sharp price increase, that 700 ahr went from $700 to $840. Like everything in business, if sales pick up , things will get better, maybe cheaper. The supply chain is a problem for them. Balqon isn't the only player in town. GBS and CALB have stock in the U.S. Canada, and elsewhere from various distributors, like Elitepowersolutions etc. It is much easier to get local nationwide stock than it was 5-7 years ago. Back again after an uneventful year with my and my friend's off-grid power supplies. I have not noticed any change in the battery performance during the year. From the charge and discharge figures the battery coulomb/current efficiency is ~99.4%. This figure sounds amazing, but does match up with a number of technical papers I have read on the subject. 'amps' the first two figures are the maximum battery charge and maximum discharge current measured over the year, the third figure is the maximum current from my solar controller. 'ah' is the raw DOD of the battery in Ah measured over the year, my pack has a nominal rating of 360Ah, the first figure is the lowest DOD, with 0 being 'full', the second figure if the average DOD, the third figure if the maximum DOD 360 should be empty, the forth figure is the number of samples the average is taken over, the fifth figure total charge going into the battery in ah, the sixth figure is the total charge drawn from the battery in ah. 'power' are the total power figures for the system, they are only for the last five-six months of the year. The first figure is the power going into the battery, the second is the power coming out of the battery, the third is power from the solar panels. Another uneventful year with both my friends and my battery. Finally got his battery out the hot tin shed and into a cupboard in his cool straw bale house. It doesn't look like the time in the shed has had much impact on his battery which surprises me. If I have read the date codes on the battery correctly my battery is four years old and has been in service for around 3 years and nine months. If we assume that each day is a cycle then it has been cycled around 1,300 times. Again I have not noticed any change in the performance of the battery. After much research I have come to the conclusion that keeping an LFP battery at ~99%SOC and floating it at this SOC will not have a large effect on the lifespan so have instituted this charging regime. This has increased the average battery SOC to 81% up from 76% and has meant we have been running low on stored energy on fewer occasions. From the charge and discharge figures the battery coulomb/current efficiency was ~99.6%. 'ah' is the raw DOD of the battery in Ah measured over the year, my pack has a nominal rating of 360Ah, the first figure is the lowest DOD, with 0 being 'full', the second figure if the average DOD, the third figure if the maximum DOD 360 should be empty, the forth figure is the number of samples the average is taken over, the fifth figure total charge going into the battery in ah, the sixth figure is the total charge drawn from the battery in ah, the seventh is the total Ah from the solar panels. 'power' are the total power figures for the system. The first figure is the power going into the battery, the second is the power coming out of the battery, the third is power from the solar panels, the forth is the power going to the loads. I run about the same sized setup as you. 300Ah 24v LIFEPO4 (Sinopoly) 8 cells in series and 1400 watts solar 5kw inverter, Cellog 8. Installed 2013 and was a bit of a leap of faith. My settings have been the same since installed, approximately the same as yours. Cells 2.95v - 3.45v. Pack 24v to 27.4 volts and I manually top balance every 6 months or so (which is never out much). So far so good, haven't noticed any drop in performance over the years. The cellog disconnects my inverter if needed via the output alarm and works fine. My battery monitor (voltronics) gets a bit out of wack if I don't reach 100% SOC for a few days, which is frustrating and means I have to rely on voltage monitoring. Good reassurance for me to see your settings are similar. Yet another year slips by, again no drama. Batteries have done ~1,700 cycles now and are nearly 5 years old, half way through my hoped for lifespan. The measured 8% minimum SOC is the lowest the whole battery has ever been, from the individual cell voltages it looks like cell 2 has about 1% less capacity that the others. From the average voltage I calculate the SOC to be ~6%-7%. Calculated battery impedance/resistance with a load of 157A on the 30th of December to be around ~5mOhms ((26.68V-25.97V)/(157A-16A). This figure hasn't changed since I installed the battery. Made some modifications to the monitoring software. We have been at home more of the time so the power consumption has gone up a little to ~3.1kWh/day. From the charge and discharge figures the battery coulomb/current efficiency was ~99.7%. Nice job Simon! Very nice work! The drama is always nice when it is low offgrid! With the fire danger year round here now, I can't say no drama anymore like the old days. With 1 year on the RESU10's I saw a 1% loss from cycling. I have no idea how to calculate the life. LG said over 20 years. I forgot, I have been keeping track of how much adjustment I have had to make to keep the battery manually balanced. I have two cells, cells 2 and 4 or I should say block of cells as there are four individual cells paralleled to make a block which have less charge loss than the others. When the cell voltage of these cells gets to around 3.5V which is about 0.05V above the other cells at the end of the absorb phase I will remove some charge from them with a resistor placed across each of the blocks for around 10 minutes which equates to reducing the charge stored in the block by ~0.5Ah. Last year I removed ~1.5Ah of charge from each of these blocks which equates to ~0.4% of SOC. Yet another year gone by. Last year marks some big changes in my system, converted from 24V to 48V and installed a new BMS and new combined MPPT solar controller/charger/inverter. 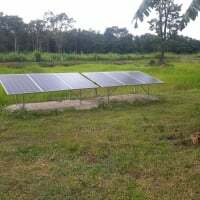 This came about because of installing two new systems for friends which is based around this hardware and increasing the number of solar panels. This work meant that my battery was left idle for around six months. With this gap I calculate that my battery has done around 1900 daily cycles. The other system that I installed about five and a half years ago which has done about 2000 daily cycles has been working without any problems and no perceivable change in performance. As the raw data is a mishmash of the 24V system data and the 48V system data it is impossible to give real summary data. Calculated battery impedance/resistance of the reconfigured 48V battery with a load of 57.9A on the 12th of January to be around ~14mOhms ((53.18V-52.45V)/(57.9A-4.6A). This compares to around 5mOhms with the old 24V setup. This includes the resistance of the interconnects, and cabling to the BMS where the current and voltage are measured. 'ah' is the raw DOD of the battery in Ah measured over the year, my new pack has a nominal rating of 180Ah, the first figure is the lowest DOD, with 0 being 'full', the second figure if the average DOD, the third figure if the maximum DOD 180 should be empty, the forth figure is the number of samples the average is taken over, the fifth figure total charge going into the battery in ah, the sixth figure is the total charge drawn from the battery in ah, the seventh is the total Ah from the solar panels. Nice Simon, Yes another year! They all melt don't they? There is a big school or institution in your country that has been testing for 4 years now on 10 different makes. I will try and dig up a link. Simon, on the minimum voltage line the last value in the string is 1.795, was there a problem with that cell, it is also reflected in the delta voltage difference, or am I misinterpreting the numbers? I am pleased someone reads the actual data, I could say that I put that in there on purpose but no I think it is just a glitch. I have been playing around with the system quite a bit with the change to 48V. Checked in the log to see when it had happened but remembered that I stopped logging individual cell voltages. Might change this. The data is interesting to me, I noticed a low cell voltage in my system, turned out to be a bolt for a sensor wire that wasn't torqued properly, details are so important, when replacing the bolts with stainless steel due to rusting, I marked each one after tightening so as not to miss one.